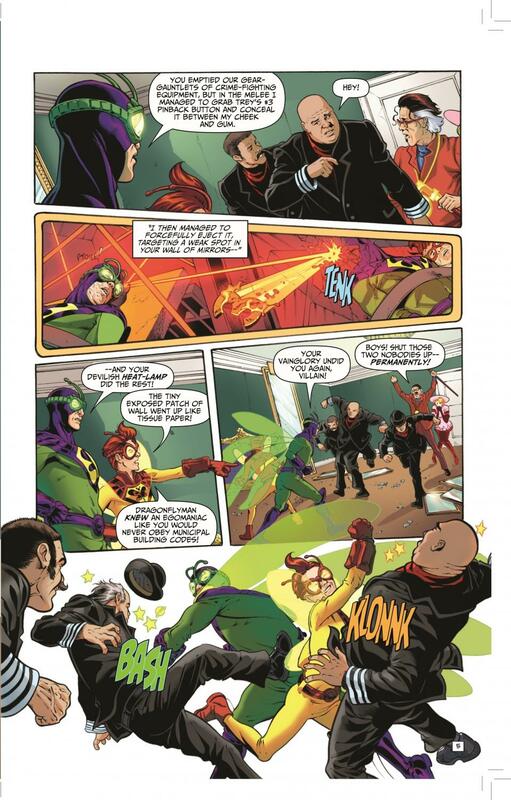 One of the things that immediately drew me into AHOY Comics is their interest in not just making comic book issues, but making comic book magazines. I barely read any comics from the top two publishers but I may pick one up every now and then and every time that I do, I am always a little disappointed when I get to the 24th or so page and am done with the entire issue already. However, there are many independent comic books that really make me feel like I am getting a complete experience. AHOY Comics’ debut issue, The Wrong Earth #1, fulfills that exact desire of mine by packing about 37 pages of content that I found enjoyable. 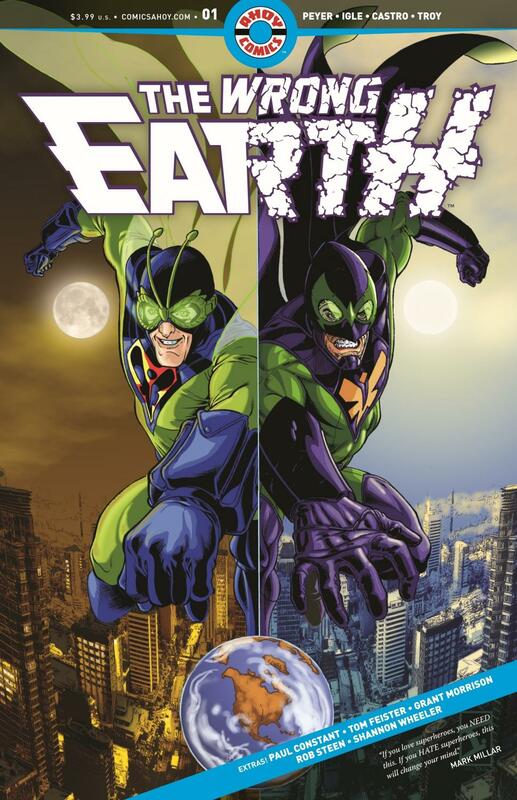 The structure of the issue starts with the main story, The Wrong Earth, which introduces us to Dragonflyman, Stinger, Dragonfly, and Number One. I was instantly enticed because I am not a huge fan of traditional superhero comics and these characters and their names are hilariously satirical without being obnoxious. 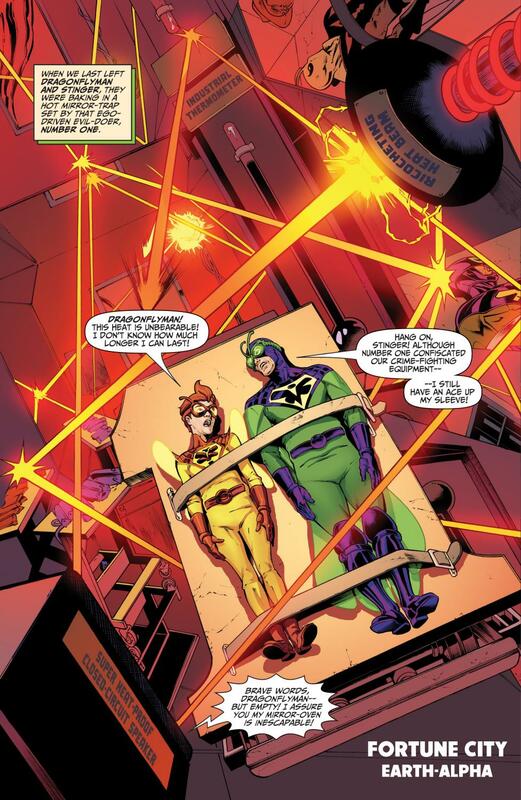 Tom Peyer, the writer of The Wrong Earth, then amazed me with the rest of this story by drawing me into this stimulating and unique story about a superhero who, in the middle of a fight with his enemy, switches places with his doppelganger in another world. Peyer’s writing embraces classic superhero storytelling really beautifully while also parodying it and it makes for a hell of a comic book reading experience. Jamal Igle, the artist for the series, flawlessly compliments Peyer’s vintage styled writing with his gorgeous artwork that is both extraordinary and classic. He also magnifies the satirical nature of the comic while keeping it subtle just as Peyer does with his writing. To expound on the very talented Jamal Igle, one of the great little extras that you get in this comic book magazine is an interview with Igle which is humorous and fascinating. The rest of the extras in this issue include a hilariously dark short comic story about Stinger, an incredible short story written by the legend himself, Grant Morrison, another interview with Captain Ginger’s writer, Stuart Moore, and a one page comic called Too Much Coffee Man. All of this content makes this first issue a really neat thing to own. You will be getting a chance to sit with the issue and spend a bit of time reading the entire thing, instead of reading through it in fifteen minutes. I definitely still enjoy regular comic book issues, but this is a great new format that I really hope will set a trend. It also helps that the content is extremely well done, especially the main story of The Wrong Earth. It did it’s job of introducing me to new characters, a new story, and a new style and I am absolutely on board already. 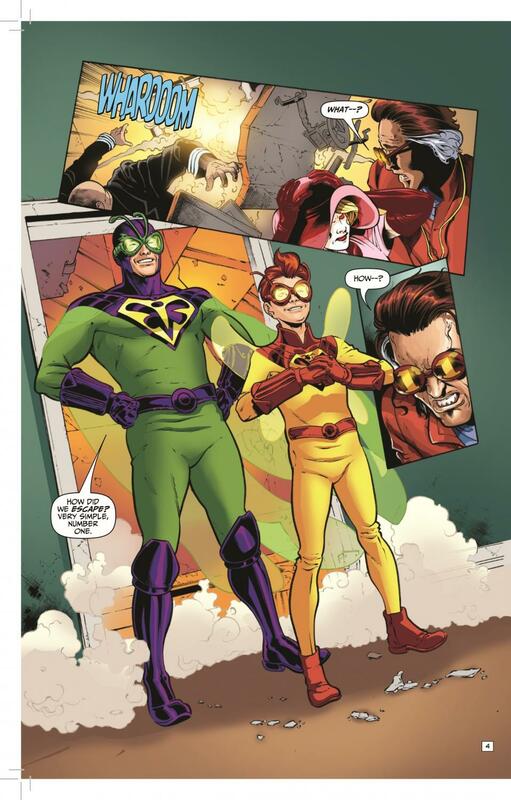 The extra content in the comic book magazine is quality content and shows us the amazing stuff AHOY Comics is about to unleash on us with the rest of their titles. All in all, reading through this issue was such an enjoyable experience and I recommend others pick it and spend the time with it as well.